All Categories Latest Stock Worcester Porcelain New Hall Porcelain Caughley Porcelain Coalport Porcelain Other Porcelain Tea Caddies/Canisters Missing a Lid? Sold Items Sold Worcester Porcelain Sold New Hall Porcelain Sold Caughley Porcelain Sold Coalport Porcelain Sold Missing a Lid? 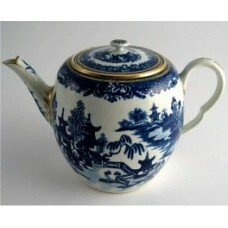 A delightful and very attractive Worcester teapot decorated in blue and white with the 'Two ..